The best home gyms for seniors should be safe and comfortable to use. They should also provide a full body strengthening workout and fit comfortably within your home. 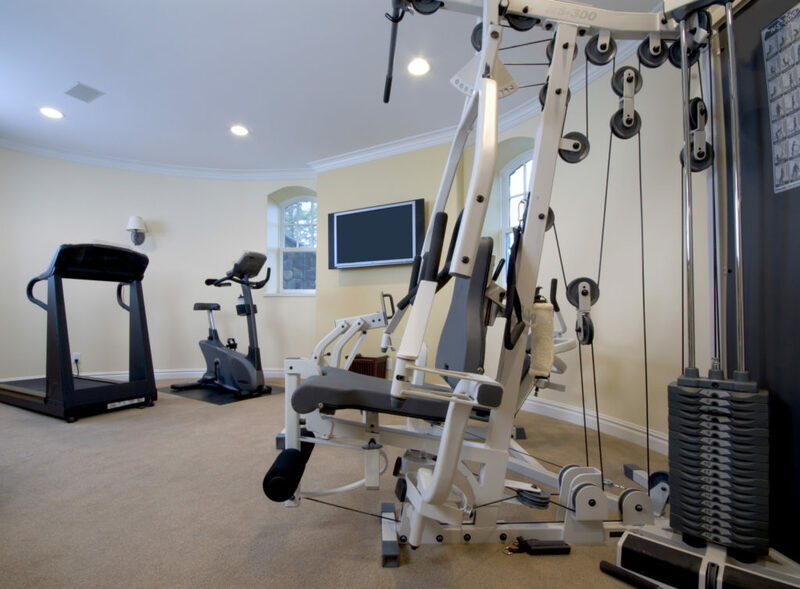 Whether you are just beginning your search or have been looking for some time now, you’ve probably realized there are a ton of home gyms on the market. This guide will teach you what to look for and help you find the right senior friendly home gym system. Strength training should be a part of everyone’s fitness regimen, regardless of age or fitness level. For our seniors, it’s even more important because it will help them maintain their mobility and independence- two things that tend to decline gradually with time. The unfortunate truth is that as we age, a lot of things about our bodies change. A few key examples that come to mind are that joints become stiffer, reflexes slow down, and muscles get smaller. Although these changes are common, they can be combated with regular exercise. That’s kind of the whole principle behind by day job (for those of you who don’t know, I’m a physical therapist). Exercising regularly as we age helps maintain strength and flexibility. It also helps with stuff like shortness of breath, fatigue, and pain. I want to get back to the point of our muscles getting smaller as we age though. The technical term for this muscle loss is sarcopenia and it’s something that affects everyone (men and women) as we age. According to Harvard Medical School, after you hit age 30, you will lose between 3-5% of your muscle mass each decade. That means if you are lucky enough to make it to 90, you could have lost as much as 30% of your total muscle mass. I have the privilege of working with folks in their 80s and 90s everyday and I get to see first hand what this lost muscle mass means- things like getting up from a chair or out of bed become difficult; walking becomes more taxing; even balance is affected, making fall risk increase drastically. Luckily, there is something we can do as we age to slow down this muscle loss: strength training. Strength training is any exercise you do against resistance. And as you become stronger, it’s important to increase that resistance in order to continue making gains. Our bodies are smart and they are very good at adapting to the stresses put on them- if you always do the same exercise with the same resistance, you will stop making gains! If the term “strength training” brings images of Arnold Schwarzenegger pumping iron to mind, don’t worry- you don’t have to use barbells and dumbbells for resistance training. You can start out doing bodyweight exercises and that still counts as strength training. The important thing is to try and achieve a full body workout with emphasis on the bigger muscle groups. Especially important for our seniors is working the hips and legs (glutes and quads) because these muscles are so crucial for transfers. Exercises like squats and lunges should definitely be part of your workout routine, but don’t forget the arms either. Chest presses, overhead presses, and rows should also be included. When first starting out, it’s a good idea to keep the resistance pretty low and concentrate on proper form. I like to use 3 sets of 10 reps or 2 sets of 15 reps per exercise. Keep in mind you will be sore after your first workout or two and that’s normal! As your muscles adapt and get stronger, you can start gradually increasing the amount of resistance you are using. Just keep in mind that muscle soreness is normal with new exercise, but pain isn’t. If you are experiencing joint pain with your exercise, you should stop. I would recommend consulting with your physician or possibly finding a local physical therapist to help you adapt your exercise routine as needed to ensure it’s comfortable and safe for you to do. Resistance training from home can be achieved in different ways. You can use dumbbells or resistance bands and get a great workout. A home gym works well for seniors because all of the necessary equipment is contained in one machine. They are also safe to use without a spotter (well, the ones I will show you are) and are less likely to cause injury to achy or stiff joints. And remember, you are never too old to get stronger. I really don’t mean to assume that all seniors have mobility deficits because I know that’s not true. I personally know several individuals in their 70’s that are still running marathons…amazing. The majority of seniors though, do have some mobility deficits, and they tend to gradually worsen the older we get. This guide is designed with these seniors in mind. If you are one of the seniors lucky enough to still be doing pull ups and HIIT training, then by all means choose a home gym that will meet your needs. No chance of getting smooshed by weights- this goes hand in hand with point 2 above, but with barbell systems you need a spotter to ensure you don’t lose control of the bar and get crushed. This is another reason to go with a system where the weights or resistance are contained within the gym- no spotter necessary either. We discussed earlier about how important it is to get a full body workout. You are going to want a home gym that allows you to strengthen both your arms and legs. Most home gyms have plenty of upper body attachments, it’s the lower body that can get neglected. This means we should be looking for gym systems that include leg developers (the attachment that lets your do leg extensions and ham curls), leg presses, or squat platforms. Remember, the goal here is to find one piece of equipment that will fulfill all of your strengthening needs. Last, but not least, you need to make sure your chosen home gym machine fits in your workout space. Luckily, if we abide by our 2 previous rules, this one should be pretty easy. There are a lot of compact home gyms that work wonderfully. The Total Gyms, for example, are great because they can fold in half when not being used. They are narrow and long when being used. Other more traditional weight systems are a little wider. Don’t worry though, as long as you have a few feet of floor space you should be able to find something that fits. I’ve been a fan of the Total Gyms ever since I saw them in action in the physical therapy clinic I worked at right out of school. These gyms are great because they are incredibly gentle on your joints and they allow you to work within your comfortable range of motion. They also use your body weight as the only resistance, so there’s no worrying about having to adjust weights. The Total Gym XLS is one of their mid-range models. If you are familiar with these gyms, you know there are several different models to choose from. I chose the XLS because it has a good ratio of exercise variety to price. It’s also one of their most popular gyms. The XLS is very safe for seniors to use. It’s easy to lay on the comfortable slide board- as long as you are ambulatory and can straddle the platform, you shouldn’t have any issues. The resistance is determined by adjusting the height of the slide board- the higher you set it, the more resistance you get. The lower the setting, the lower the resistance (there are 6 total height options). The pulley system works well with seniors because you can easily adjust your range of motion for each exercise. For example, if you have stiff shoulders, you can easily adjust your arc and stay within your comfortable range during upper body exercises. Speaking of exercises, the Total Gym XLS offers a total body workout. The XLS includes an upgraded squat stand that is ribbed for extra stability and comfort during use. These gyms are great for squats by the way- they offer one of the most comfortable ways to do squats, that’s why they are often found in rehab settings. You can perform over 80 different exercises on this machine. The XLS is also really easy to assemble. And by easy, I mean it comes fully assembled. Pull it out of the box, unfold it, and you’re ready to start exercising. The biggest downside to this gym is that it does take a fair amount of floor space. The gym itself is very narrow (only 19″ wide), but it’s about 7.5 feet long. It does fold in half for storage, so if necessary you could store it away after your workouts. Overall, the Total Gym XLS is safe to use and gentle on the joints. The pulley system is smooth and can easily adapt to any range of motion deficits. If you are looking for a comfortable and safe home gym, the XLS is a safe bet. See full review. P.S.- sometimes Amazon has the best price, sometimes it’s cheaper directly from Total Gym. Click the coupon above to see Total Gym’s best price. The Marcy 150 lb Home Gym is a great example of the traditional home gym machine. It’s probably what most of you picture when you think of a “home gym”. It’s your classic cable system machine and it would make a perfect home gym for seniors because it’s easy and safe to use. It’s also very budget friendly. I’ve personally gotten to use this gym before, as well as see it in action with a senior. One of my patients had one and we started incorporating it into our treatment plan. He loved it. I thought it worked exceptionally well for him and it definitely helped him stay motivated to work out more. The Marcy 150 lb gym is the upgraded version of their 120 lb model. And yes, you guessed it, the biggest difference is how much resistance is offered in the weight stack. You also get a nice removable curl pad too. This gym is definitely safe for seniors to use. It’s easy to get on and off- just like sitting on a chair. That’s actually one of the nicest features- all of the exercises can be performed from a sitting position. This is perfect if lying horizontal is uncomfortable. All of the exercises use the same weight stack and there is no risk of dropping weights or losing control during your workouts. When it comes to exercises, this gym offers all of the classic moves: chest press, butterfly, and lat pulldown. It does come with a leg developer for leg extensions and ham curls. It has a removable curl pad which makes it easy to work your biceps. There is also a lower pulley that can be used for rows or hip exercises with the foot strap. So you can totally get a full body workout here. The Marcy 150 lb home gym is also pretty compact. You only need a floor space of about 3′ x 6′ for this unit. This comes in handy if your workout space is limited. The biggest downside to this gym is just that- it is pretty small. Taller individuals might find the handles for the chest press are a little too close. Other users have also complained that assembly is challenging, but if you or a family member is handy, it shouldn’t be an issue. Overall, I think this would make a great home gym for seniors. It’s safe to use and can offer strengthening exercises for the entire body. It’s also well priced and doesn’t take up too much room. The Powerline BSG10X is another perfect example of the classic home gym machine. This gym is basically an upgraded version of the Marcy machine we just discussed. The BSG10X offers a little more resistance and a little more exercise variety, but it’s equally as senior friendly as the Marcy. Like the Marcy gym, you sit upright for most of the exercises here. There are also several moves you can do standing up- it really depends on what exercises you want to perform. This gym has 3 pulley systems, which drastically increases the amount and variety of exercises you can do. The upper pulley is used for moves like lat pulldown, tricep pulldowns, and even bicep curls. The mid-pulley can be used for rows and shoulder internal/external rotation (great to strengthen your rotator cuff). The lower pulley would be utilized for seated rows, standing bicep curls, upright rows, and any hip strengthening moves you want to do with the leg strap. Of course this home gym also has a chest press station and a leg developer attachment. You can also get a leg press attachment, sold separately. All together, the BSG10X offers over 40 different strengthening exercises. With this much variety, this home gym could easily replace a gym membership. Price wise, I would put the BSG10X in the mid-range group. It costs almost 2x as much as the Marcy, but that really speaks to how affordable that gym is. If you were able to cancel a gym membership, it wouldn’t take long for the BSG10X to pay for itself. This gym is a little larger than the Marcy, but it should still be pretty doable in most homes. It requires a floor space of about 4′ x 6′, with a little added room for comfort during use. Users all agree this gym is surprisingly easy to assemble. Most have it up and functional within an hour. The instructions make sense and all necessary tools are included. Lastly, the BSG10X is backed by a 10 year warranty on the frame and a 1 year warranty on all parts. Not bad for a gym in this price range. There were some complaints from users that the cables don’t last as long as they should. If this is the case, they are definitely under warranty for the first year, but after that you would be responsible for replacing them. The Powerline BSG10X would make a great home gym for seniors looking for a more extensive weight training experience. You can perform a ton of strengthening exercises safely from this machine. The solid warranty also adds a little more peace of mind. If you or the senior in your life is looking for something a little different, Bowflex might have exactly what you’re looking for. I’m sure you’ve seen these machines on tv, they have a pretty extensive infomercial campaign going on. Anyway, the Bowflex’s are pretty unique in that they use their patented “power rod” resistance system instead of a weight stack. The power rods provide a resistance similar to resistance bands. It feels a little more fluid, a little smoother than a cable stack. They can also provide a ton of resistance- the Blaze comes with 210 lb of resistance standard, but you an upgrade to 310 or even 410 lb if you want to. The power rod system feels comfortable to use, but there is a little more work involved to select your resistance and adjust the machine for each exercise. It’s not that hard, but seniors with dementia or arthritis in their hands may need help with changing the settings. Bowflex, like Total Gym, offers several varieties of their home gym. The Blaze is one of the mid-range models and it has a good features to price ratio. The Blaze is safe to use- there are no free weights that can be dropped and the power rods are stationary, so there’s no risk of them flying out of control during use. The biggest benefit the Blaze has to offer is workout variety. You can perform over 60 different exercises on this one machine. This would be a good choice for an active senior looking for a more dynamic workout. With all of the pulleys and attachments included here, there’s really no limit to what you can do. You can do squats on the Blaze. You can even do cardio rowing with the sliding seat. The multi-grip handles and included ankle strap provide a wide range of possible exercises. The lat bar and squat bar are also included. The Blaze takes up a little more floor space than the prior 2 home gyms discussed. This gym requires a space of about 3′ x 8′ during use, but it does fold up for storage. When folded, the length cuts down to about 4.5′. This gym is backed up by a 5 year warranty on the gym and a lifetime warranty on the power rods. Overall, the Bowflex Blaze is a dynamic home gym with a lot to offer. The power rod system delivers a smooth, low-impact resistance that would work well for seniors. That said, I would recommend this gym for the more active seniors that aren’t limited by mobility deficits. See full review. Rounding out our list is the StrengthTech EXM2500S (wow, really long name). This gym would make a great addition to any home gym, not just seniors. It actually made my list of best home gyms for the year because I think it has a lot to offer and it’s actually priced well for what you get. The EXM2500S is another more traditional single-stack home gym system. This one differs slightly from the Marcy and Powerline gyms because it has 2 separate stations: one seat for the lat pulldown bar and leg developer, one seat for the pec station and middle pulley. There’s also a 3rd lower pulley that is accessed on the same side as the pec station. The result of organizing the gym like this is the feel of a commercial grade system. You have more room to move. You don’t feel cramped by the machine when exercising- something that can happen on smaller home gyms. As a cable system gym, it’s very safe for seniors to use. The seats are easy to access and easy to get up and down from. Selecting the resistance is easy in this system- simply slide the pin in the desired weight and you are ready to start lifting. Speaking of lifting, the EXM2500S can’t offer the variety of exercise the Blaze can, but it does offer all the traditional home gym movements. Lat pulldowns, chest press, flys, rows, tricep pulldowns, bicep curls, leg extensions, hamstring curls, and many more are all doable. This gym offers 210 lb of resistance, which should be more than enough for most seniors (and non-seniors alike). This StrengthTech gym is the biggest model on the list, it requires a floor space of roughly 5′ x 7′. And no, nothing folds away for storage here. If you purchase this gym, make sure you know exactly where you want it before you assemble- this thing is heavy and very difficult to move once assembled! Overall, this is a great home gym. It’s one of the most popular and well-reviewed gyms on the market. It’s also backed by a lifetime warranty on everything. It is the most expensive home gym on our list, but remember- you usually get what you pay for, and in this case that means a lifetime warranty. This gym would work best for seniors looking for a commercial grade machine or who are looking to stop going to the local gym to workout. Just make sure you have enough room in your home. We should all be exercising regularly for proper health. I know it’s a lot easier said than done. But as we age, it’s even more important because exercise, especially strength training, can help us maintain our mobility and allow us to continue doing the things we like to do. Strength training comes in many forms. The key is to find an exercise regimen that is safe and enjoyable for you. We’ve talked a lot about safety throughout this article, but the fact is if exercising is too much of a chore, than odds are you won’t stick with it. Finding a home gym machine can help add a little variety to your routine, making it more enjoyable and less dreadful. Cable systems and the Bowflex/Total Gym machines work well with seniors because there are no free weights or plates involved. They are also easy to get on/off and are pretty low impact. Once you have a home gym in mind, double check the dimensions and measure out the space in your room to make sure it will fit. I hope this guide was helpful. If you have any questions or comments, please leave them below and I’ll get back to you soon. If you’d prefer, feel free to email me as well.